1. You want to go beyond the green fields and quaint sheep of the Emerald Isle, deep into the heart of “dear dirty Dublin” at the turn of the 20th century. 2. Now that you’re all grown up, you’re ready to relive the sometimes painful experiences of childhood, adolescence, and adulthood. 3. You’re a reader with a real life, looking for something short that packs a powerful punch. Joyce gives you 15 for the price of one in this collection. 5. In every story, Joyce gives new meaning to “epiphany”—a moment that suddenly reveals “whatness” of a thing, person, or situation. 6. You want to see how people can be shaped by all kinds of circumstances, from religion to money to family history to politics. 7. Common people often make the most interesting characters, and everyday, ordinary experiences make for rich stories. 9. You gave up on Ulysses—and you didn’t even try Finnegans Wake—but you still want to read James Joyce. 10. This is the perfect book to go with a pint. 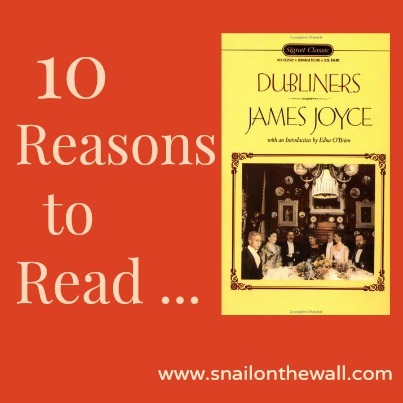 This entry was posted in The So-called Classics and tagged 10 Reasons to Read, classic literature, Dubliners, James Joyce, short story collections. Well, Lady, I am headed for two weeks of hiking in Ireland in the late summer. Cresting out over emerald hills in the daytime and sipping Celtic suds after the gloaming. I have always been terrified of James Joyce, but now is the time to dip my toe in the The Dubliners. Thanks for the nudge. I am working hard on my second novel, by the way. THRU: An Appalachian Trail Love Story continues to get nice press.